A lovely family friend of ours, Deren, passed along this great Turkish recipe to us. Originally from Turkey, she stayed in the United States for too brief a time before moving back home to her family. We still miss her terribly! I have altered it from her original but it is super tasty and I must admit I am a little bit obsessed with it! I think it makes for a great and unique side dish for the holidays! Put the plain couscous in a wide bowl. Cover with boiling water until a bit higher than the couscous. Add the salt and pepper, stir and then cover. Let steep for 5-10 minutes. In the meantime, chop the tomatoes and thinly slice the scallions. 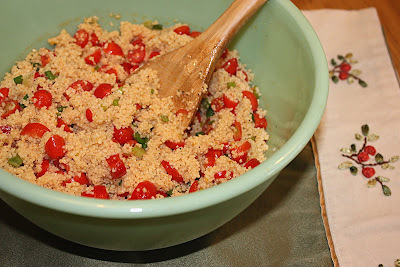 After the couscous is fluffy, add the lemon juice, olive oil, and hot pepper sauce. Add the chopped vegetables and parsley, mix well and refrigerate until cold.